As we were leaving a park late in the afternoon yesterday, out trotted Mr. Coyote. He would be out for either of two reasons, maybe for both. One was for food — this coyote is being fed by some park visitors — please discourage this if you see it happening. It is feeding which leads to food-conditioning and a coyote approaching humans. When in close proximity to humans, the chance for a bite, even if it is inadvertent, increases many times over. The other reason, just as important, is the coyote’s need to show/message folks and dogs that he is there — the proud owner of this domain, so, “don’t even think about moving in, folks”. We ran into Elise, a regular walker there, and chatted as we watched. Elise asked me to post the photos I took to a blog, which is why I’ve written this up and given it this title. As usual, the resident coyote came to within his normal 20 or so foot distance from people and dogs and stood still, right in the middle of the wide fire-road. We all stayed well away from him, allowing him to feel safe and ourselves, too. Elise’s dog was very focused on the ball and, along with keeping a safe distance away, chose to ignore the coyote, and vice-versa. The little 35-pound dog we had with us stood perfectly still and watched the coyote with us, but this little dog may have been messaging back at the coyote in ways we are unaware of. The coyote messaged him mildly, as shown in the photo above, and we backed further away. The coyote’s message was clear: stay away. Visitors to the park who found themselves right there at that moment and didn’t know the coyote were the best at respecting the coyote’s space and giving him a wide berth, and walking away from him if he began approaching. The long-time visitors to the park had already had time to assess this coyote’s behavior and had decided this coyote really wasn’t dangerous — that if the coyote happened to look ferocious, it was all bluff. Several of these — most were large dogs and owners — walked calmly right by the coyote with their dogs unleashed but apparently under voice control. As expected, the coyote did not approach them and even backed away, but the coyote’s messaging intensified as these individuals came too close (see photos below). At this point the little 35-pound dog was taken away from the scene and Elise walked on, so there were no dogs now, just spectators — about 8 people — watching him. The coyote stood in the middle of the road, wandering at times to the edge where the grasses began. He kept watching everyone, watching their every-move for danger and for signs of a handout. And then, the show began. At the edge of the road, in the grasses, there was movement. Quicker than a flash, the coyote caught the mouse. Coyotes are superb hunters, but whether through design or ineptness — I think the former: look at how fine-tuned the coyote is with his teeth: carrying that mouse by its tail and later by the scruff of its neck without hurting it — the mouse escaped, and kept escaping, and the coyote persisted in re-catching it, without trying too hard. 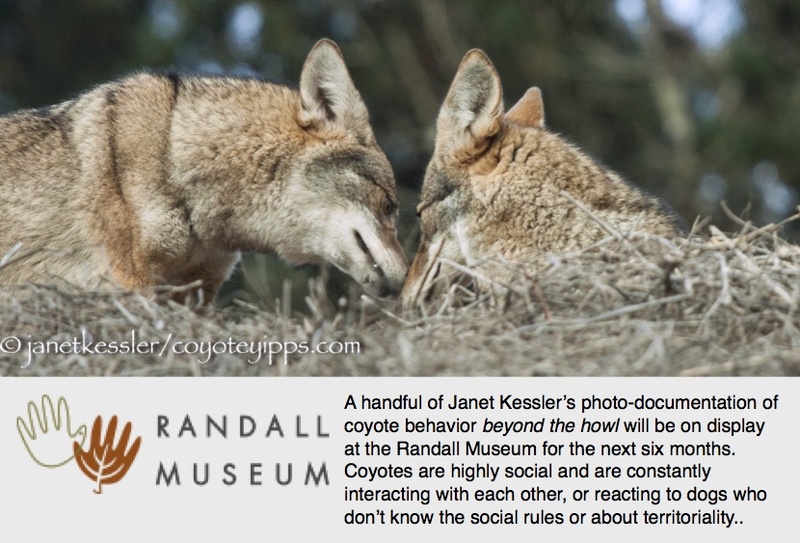 What is of greatest interest here is that the coyote repeatedly passed back and forth in front of the spectators, showing off the mouse, and sometimes just showing off himself without the mouse. He did this many more times than the video shows. Towards the end of the video (it is several videos spliced together), the coyote spends a long time apparently scratching himself, but in actuality he was probably thinking. Coyotes are much more intelligent and wiser than most people give them credit for.